The PHOENIX project from the year 2000 is obsolete and no longer supported. The information on the following pages is an introduction to open-baffle loudspeaker systems and highly educational. The PHOENIX evolved via the ORION into the LX521.4. 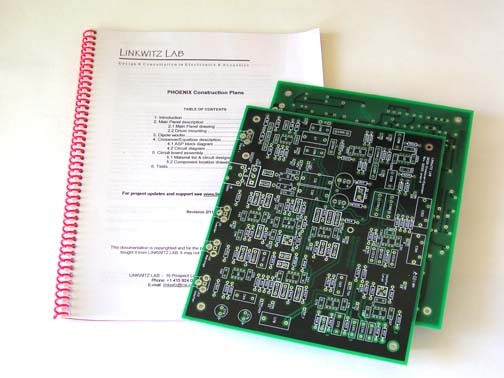 Use of a printed circuit board greatly simplifies the construction of the electronics for the PHOENIX or the addition of a dipole woofer to an existing system (FAQ10, 15). Stuffing the leads of the components through the correct holes of the board is made easy by having a silk screened designation for each circuit element and a corresponding match with the parts list. You solder the leads to pre-tinned pads on the backside of the board. The board is then fully functional since input and output connectors are mounted on the board. All this saves you a major amount of time - even when it takes about 4 hours to fully load and solder one board - over constructing your own point-to-point wired electronics or designing your own printed circuit board. And while it helps you with building an exceptional loudspeaker system, selling the printed circuit board gives me some compensation for development expenses, for the extensive information that I provide you with and keeps the pages free of flashing advertisements to pay for the site. The latest version of my printed circuit boards is the ORION Analog Signal Processor. It is a universal circuit topology for building a wide range of 3-way crossover/equalizers. It is used for PHOENIX and ORION but also available for your own speaker development, be it dipole or box. The PHOENIX speaker system was introduced in 2001. Its construction and the design philosophy behind it is fully described in the pages of my website. The construction plans are newly revised and incorporate the changes that have occurred for various reasons. I now recommend the Peerless 12" XLS driver, 830500, for the dipole woofers and a 24 dB/oct crossover between woofer and midrange. Midrange and tweeter choices continue to be the Scan Speak 21W/8554 and D2905/9700 drivers. If you want to use different drivers, then the ASP is flexible enough to accommodate them. Any necessary filter circuit changes are up to you and I cannot give you specific help over what you can find on this website and on my Archive CD. Schematic of Crossover/EQ circuit. All component values and circuit designations. You can purchase the ORION ASP printed circuit board by itself for your own 2-way or 3-way active loudspeaker project design. From the block diagram and its application to the ORION you should be able to tell the wide range of signal processors that can be built with it. The circuit board comes only with the documentation that is necessary for using it. The circuit board is meant to simplify your own ASP assembly when you know how to design an active crossover/equalizer. I cannot provide you with more help than what you can find on my website Archive CD and the Active filters pages. Purchase the PHOENIX Construction Plans+ if you are learning to build active speakers. The WM1 printed circuit board allows the construction of a variety of active line-level filters for loudspeaker equalization. In particular, it provides dipole equalization and the Linkwitz Transform. For the design of the filters and to determine component values follow the outline given on the Active Filters page and on the Archive CD. 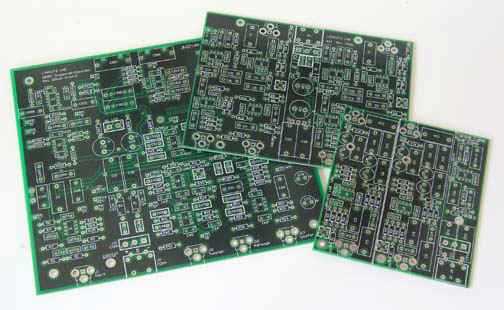 The MT1 printed circuit board allows the construction of a variety of active line-level filters for loudspeaker equalization. In particular, it provides crossovers, baffle step and delay compensation for a 2-way active speaker. For the design of the filters and to determine component values follow the outline given on the Active Filters page and on the Archive CD. Contact me first, if you are considering commercial use of the printed circuit boards.